The Rainbow Beach RSL Sub Branch will conduct a service commencing at 10.50 hours at the cenotaph in recognition of the 11th hour of the 11th day of the 11th month 1918 when the guns of the great war fell silent,100 years ago. Rainbow Beach RSL President, Joel Casey said, “We also remember those who served and sacrificed in all subsequent wars, campaigns and peace-keeping operations that involved Australian and allied personnel. 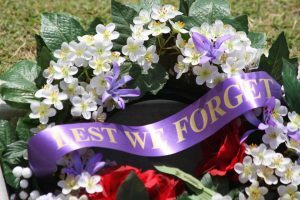 Tin Can Bay will be holding a service at the Tin Can Bay ANZAC Memorial Park commencing at 10.45am for the commemoration of the centenary of the Armistice that ended the First World War. All members of the public are invited as well as the Veteran community. Trivia was a tournament of fun!